According to some sources this print by Hiroshige II (Shigenobu: 1826-69) is the finest example from the series Edo meishō zue. Strong wood grain visible and mica on the bokashi of the night sky. Notice, using the enlargement tool, the geese flying across the sky, some of which are highlighted by the full moon - a common motif used for centuries by Japanese in art and literature. This print is trimmed to the image. That means that the date seal for 11/1862 and the publisher's seal for Fujiokaya Keijirō are missing from where the left margin would be. 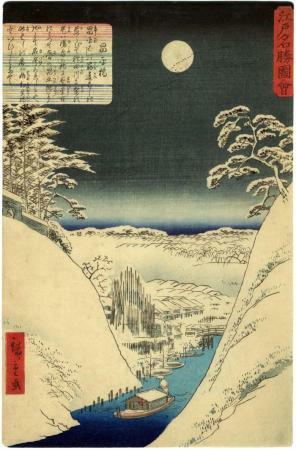 Mikhail Uspensky in his Hiroshige: One Hundred Views of Edo describes the Shōhei Bridge location on page 114 as an area known as the center of Confucianist thought in Edo. He also notes that this bridge was also known as Aioibashi or "the bridge of life (or birth) together" or the Imoaraibashi or "the bridge where potatoes are washed", but its official name Shōheibashi means "the bridge leading to the academy of the Shōheiko" which was located on the right bank of the Kandagawa.